Mildred Miller was born in Philadelphia and received her higher education at Lafayette College, John Hopkins University and the University of Maryland. She began her art studies at the Pennsylvania Academy of the Fine Arts (1910-15) with Anshultz, Breckenridge, Vonnoh, Garber and Violet Oakley and was awarded the Cresson Traveling Scholarship twice from the Academy in 1914 and 1921. 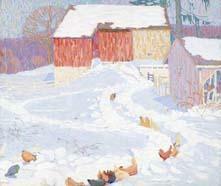 She also studied at the Art Students League summer school in Woodstock in 1913. Miller became resident artist (1916-34), instructor (1926-34) and co-director at the Pennsylvania Academy's summer school in Chester Springs. Following nearly twenty years of service at the Academy, Miller taught private painting classes in Cape May and Birington, New Jersey, before moving permanently to California where she was an instructor in the state adult education program (1945-58). She would live out her life on a small fruit ranch in Valley Center, California. Miller painted in oil, watercolor, and gouache. She employed a broken brush stroke technique using repetitive strokes and a slightly varied palette giving her backgrounds an interesting mottled effect.She was also masterful in her handling of light and often her later works appear quite similar to those of Edward Hopper. Whether it be a landscape, still life, figurative work, or interior scene, Miller's paintings possess a pleasing sense of clarity and color. Married sometime in the mid-teens, her earlier work bears her maiden name of Mildred Stern. She exhibited at the Pennsylvania Academy (1915-1918-34) winning prizes in 1920 and 1931, the Chester County Art Association (1935 prize), the Philadelphia Plastic Club (1937 medal), the San Diego Fine Arts Gallery (1947, 1949 prizes), the San Diego Art Guild (1952, 1955 prizes), and the San Diego Art Institute (1958 prize). She also exhibited at the Corcoran Gallery Biennials, the National Academy of Design, the Baltimore Museum of Art, the Detroit Institute of Art, the Brooklyn Museum, the Art Institute of Chicago, the Phillips Memorial Gallery (Washington, D.C.), the Philadelphia Sketch Club, the Baltimore Watercolor Club, the Peabody Institute, the Carnegie Institute, the Albright Gallery and many other locations in California and the Midwest.